I’m not sure if you read my post a couple of weeks ago about how I felt I had lost inspiration, but its back and you are to thank! A few weeks ago I wrote about how I had lost my inspiration. I felt lost and didn’t know what to do. In times like that I had always turned to writing and while in the past this had been private I decided to share it all with you. Don’t get me wrong it was bloody scary, but I am so glad I did as the outpouring of over I received was like nothing I had ever had before and YOU reignited my passion. First of all – own it. Yeah you’ve lost your passion right now and thats ok. It is ok to lose your way sometimes because often when you step off the beaten path (literally and metaphorically) the most beautiful things can happen. I owned the fact that I lost my passion and do you know what – it worked. I knew I had lost it so I had to actively LOOK for it again. I looked in the small things and the big and eventually found that spark again. 2. Take a bath or a veryyyyyy long shower. I don’t know what it is about water, but when I am in the water I am calm, collected and my mind is clear. I have always been this way. My best ideas come to me when I am in water so often when I feel like I need a good idea I will run a bath and surround myself with the things I find the most inspiring such as books, candles, snacks (because thinking makes me hungry) and magazines. During uni I used to study in the bath when I wanted a change of scenery and if you ask me where I spend some of my working day I would probably answer with the bath (I’m very lucky to be able to work from home). Water fuels my passion. Thirdly, surround yourself with what inspires you. Cover your desk until you cannot see the desk no more and comb through the pages of books, magazines, pinterest, google images, instagram – trust me this will drum up so many ideas. While you’re doing this, have a snack. Your brain functions better when you are full and brain food is an essential part of help those creative juices flow. Treats are nice, but stick with a healthy snack. I love nut mixes or popcorn and neither are ever very far from my desk. They are relatively healthy and full the gap between meals. Four – chat to others (even a two year old can help). This is what helped me the most. Literally just talking to people who were going through what I was and even if they didn’t have the answers it was so nice to know that I was not alone. Chatting with others, likeminded or those in a completely different field, will also allow you to get a different perspective on things and allow you to shift focus. Nine times out of ten this has helped me and that one time it didn’t it was because I was talking to an engineer who had NO creative bone in his body whatsoever (so maybe don’t go too far off from your field). Number five – enjoy some ‘me time‘! Self care is important and when you feel your best, you function the best so take some time out and treat yourself! Do your nails, read that book or have a nap. Just do something YOU enjoy. Lastly, enjoy your life. Life is unpredictable and you often don’t know what will come next so just enjoy life while you can and often, in doing that, the inspiration will appear when you least expect it. Oh wait, one more thing!! Sometimes giving up isn’t all that bad. Giving up can help. I know it sounds weird and I am probably not explaining it right, but I literally gave up finding inspiration once. I just decided it was gone and it probably wouldn’t come back so I just went back to my day job and plodded along through uni (this was a few years ago) just not thinking about my creative passions to be honest. One day, completely out of the blue, I was helping a customer and this wave of ideas just came over me. I wasn’t looking for them and I wasn’t even aware that what I was doing at the time had lead me to them in a weird sort of way. 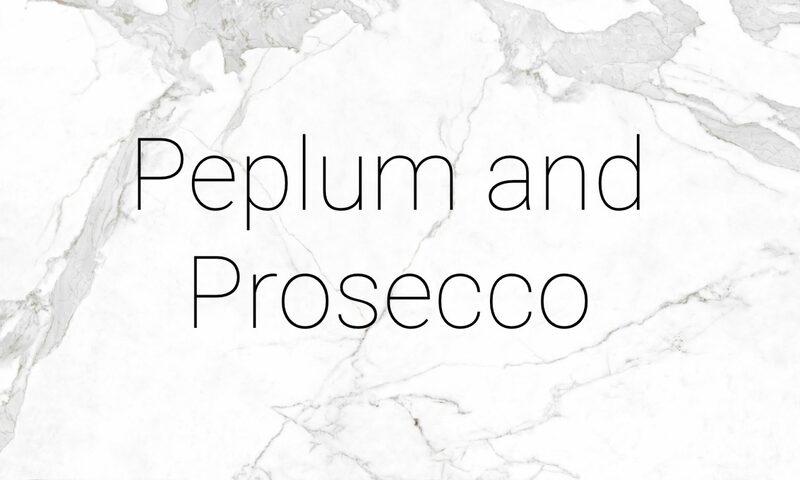 Me ‘giving up’ on seeking inspiration led me to starting Peplum and Prosecco and to where I am today. So sometimes giving up is not as bad as people make it out to be. If you have lost inspiration, I really hope this helps. If you’re reading this because you felt like reading something that may help, I hope this helps one day. However, if you’re reading this and you’re full of inspiration then share it around because sometimes people like me need people like you.